Company: Trichogaster leeri (Pearl Gourami) is suitable for community aquarium tanks with other peaceful species. Aquarium setup: Trichogaster leeri (Pearl Gourami) should be kept in a well planted aquarium. They prefer an aquarium with dimmed light and a dark bottom. They should never be kept without floating plants. Avoid heavy circulation. 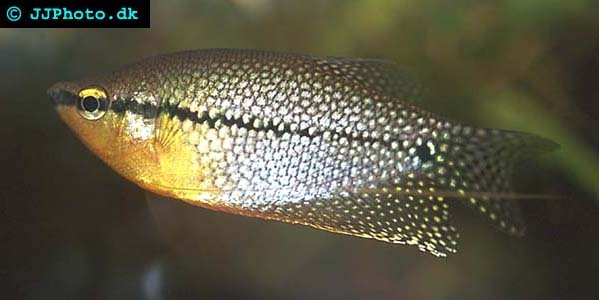 Feeding: Trichogaster leeri (Pearl Gourami) accepts most kinds of food. including dry food. Pearl Gouramis should be feed a variety of different foods. Breeding: Trichogaster leeri (Pearl Gourami) builds a bubble nest among floating plants. A higher water temperature can help stimulate spawning. The spawning itself takes place under the bubble nest and the very small eggs float up into the nest. The male guards the nest. The female takes no part in the breeding process after the eggs have been laid and the male will aggressively keep her away from the nest. The male guards the fry until they become free swimming and sometimes a couple of days after that.